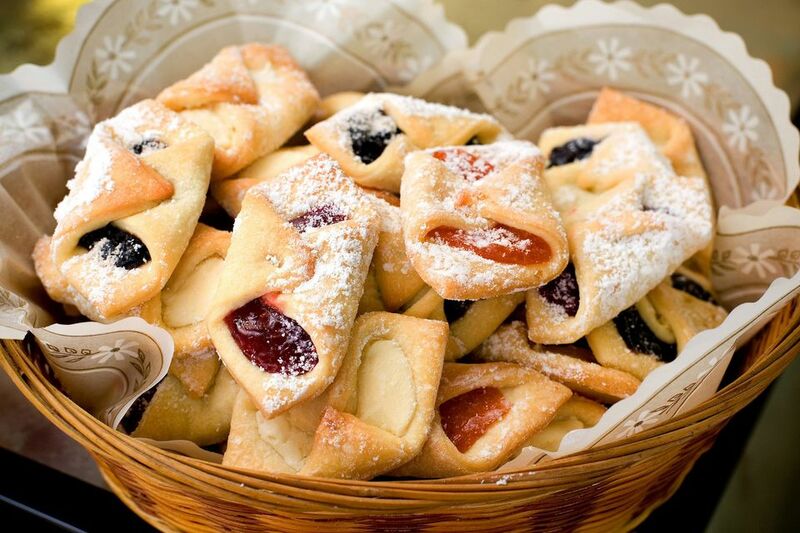 This recipe for kolachky comes from Sophia Saliwonczyk, who is Serbian. It is a variation of Polish kolaczki that uses yeast and a combination of shortening and butter to produce a marvelously flaky pastry. In a large bowl, mix together flour and yeast. Work in Crisco and butter. Add eggs and sour cream, mixing with your hands until well incorporated. Shape into a ball, wrap with plastic, and chill at least 1 hour or overnight. Heat oven to 350 degrees. Line baking sheets with parchment paper or bake on ungreased pans. Sprinkle granulated sugar thickly on a flat surface. Roll out dough to 1/4-inch thickeness. Cut into 3-inch circles. Place 1 tablespoon of filling in center and either fold two ends to the center and pinch, or fold in half, crimping the edge, to form a half moon shape. Transfer kolachky to prepared pan and repeat until all the dough is finished. Bake 15 to 20 minutes or until edges start to brown. Cool and dust with confectioners' sugar. Store tightly covered.